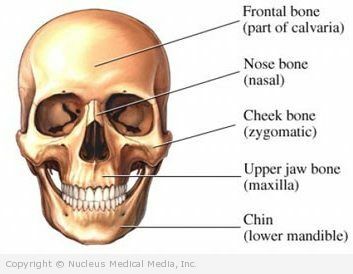 A nose fracture is a break in the bones of the nose. A broken nose is caused by a blunt, hard blow to the nose. It often occurs along with injuries to other parts of the nose and face. X-rays of the nose — usually not necessary, but may be used to confirm the fracture and check its location and severity. CT scan — usually not necessary, but may be used to confirm the fracture and check its location and severity. Apply ice or a cold pack to your nose for 15-20 minutes, several times a day for several days. This helps reduce pain and swelling. Wrap the ice or cold pack in a towel. Do not apply the ice directly to your skin. If you are diagnosed with a nose fracture, follow your doctor’s instructions. Wear protective headgear with face masks when playing contact sports, or when riding a bicycle or motorcycle. Wear a seat belt when driving or riding in a car.